Recently, I had an opportunity to take week-long sabbatical. In case you do not know, a sabbatical is “A sabbatical year is a prolonged hiatus, typically one year, in the career of an otherwise successful individual taken in order to fulfill some dream.” In my case it was not a year, nor was it necessarily to fulfill my dream. It was however to gain perspective, and a vantage point about my life. Everyone needs that type of time to consider how and where one is going. I was grateful to have the time to engage & reflect, listen & hear, step & pause. One of the exciting events that I chose while on sabbatical was to climb what is called a 14′er (or fourteener) known as Quandary Peak. In case you have not connected the dots, I was out-of-town visiting the state of Colorado. Colorado has breathtaking views, clean air, and space to “take it all in.” Colorado has over 50 14′ers and all have views that extend beyond the horizon. Quandary is one of many and is a beginners 14′er with a gradual but intense incline. As I seem to do with most events in my life, I experience them to the fullest measure, meanwhile I extract the symbolic meaning of them as I am engaging and participating in the adventure. Quandary Peak is a 14,265 foot Peak southwest of Breckenridge that begins in the trees and ends up above the treeline. The trail is relatively easy to follow until crossing the treeline and traveling onto the rocky path towards the summit. As I was venturing upwards, I was remembering when I ran my first marathon in the year 2000. One of the key learnings then was, “anyone can run a marathon, one must simply learn what their pace is to complete the race.” Then, that was a good learning. Knowing what your pace is enables you to complete your race. Life is a race and you are competing with yourself. Knowing what your personal pace is enables you to complete it with the time that is commensurate with your own abilities and commitment. It is so easy to look around and observe the other competitors and compare yourself with what is perceived about “the other.” What an illusion! It goes to show, life is filled with illusions. Back to the climb. On this mountain the Lord Almighty will prepare a feast of rich food for all peoples, a banquet of aged wine, the best of meats and the finest of wines. On this mountain He will destroy the shroud that enfolds all peoples, the sheet that covers all nations; He will swallow up death forever. The sovereign Lord will wipe away tears from all faces; He will remove the disgrace of His people from all the earth. The Lord has spoken. Step into Life, your life. Go to the summit, your summit. See the peak, the view, the majesty of His glory from your perspective One Step at a TIme! You will receive as you trust each step along the way! 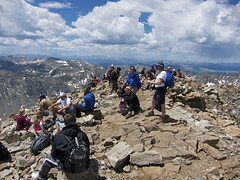 Photos courtesy of Google & 14ers.com, Flickr, tab2space. © 2016 Life Point Counseling - All rights reserved.